MIRROR, MIRROR ON THE WALL-WHO’S THE FAIREST TWIN OF ALL?? Gemma Cardano’s face has been horribly damaged in a construction accident. Ben Halsey, top plastic surgeon at St. Joe’s Hospital in Vancouver, will need all his renowned skills to reconstruct what had been a beautiful face. Instead of the usual computer generated template of Gemma before the accident, Ben learns he can use Gemma’s identical twin, Sera, as a model for the reconstruction. But Sera gets past all his defenses. Trouble is, her twin sister–Ben’s patient, Gemma, has fallen for him as well. And Gemma’s determined to have Ben, no matter how many lives she wrecks in the process. She’s created havoc for Sera before, and Sera’s always walked away. Can she this time, when love is a factor? Who isn’t fascinated by twins? How much alike are they, really, if they’re identical? And what’s it like to have a body double? I met a plastic surgeon at a dinner party, and he told me a fascinating story about using a twin to repair a guy’s face. The city was doing major construction at St. Paul’s hospital in Vancouver at the time, and bingo. 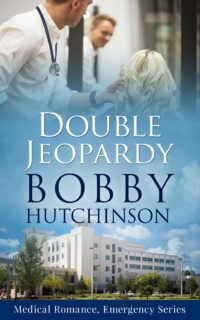 For a writer, the elements were all there for DOUBLE JEOPARDY.